If you go looking for it, just about halfway uptown and halfway downtown, there's this hotel stuck like a pin all the way through the world. Down inside the Artemisia it's this mortal coil all over. Earthly delights on every floor. The hotel Artemisia sits on a fantastical 72nd Street, in a decade that never was. It is home to a cast of characters, creatures, and creations unlike any other, including especially Zelda Fair, who is perfect at being Zelda, but who longs for something more. Multiple-award-winning, New York Times' bestselling author Catherynne M. Valente once again reinvents a classic in Speak Easy, which interprets "The Twelve Dancing Princesses" if Zelda Fitzgerald waltzed in and stole the show. This Prohibition-Era tale will make heads spin and hearts pound. It's a story as old as time, as effervescent as champagne, and as dark as the devil's basement on a starless night in the city. The cover art is an ornate affair, which is fitting, in that "ornate" is as apt an adjective as any to describe Valente's ridiculously pretty prose. It's what's inside that counts, of course, but it's nice, nevertheless, when what's outside also factors into the mathematics. Now I have a confession to make before I say good day. 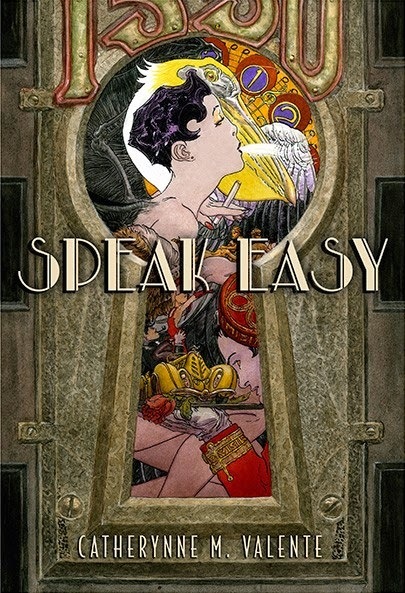 When I saw Speak Easy mentioned in the Subterranean Press newsletter, my first thoughts were: What? Haven't I read this already? I haven't. I have, however, read—and reviewed—a very similar story in recent years. Like Speak Easy, The Girls at the Kingfisher Club is a prohibition-era reimagining of The Twelve Dancing Princesses. To maker matters worse, this is far from the first time I've mixed Catherynne M. Valente up with the author of The Girls at the Kingfisher Club, Genevieve Valentine. Why? My best guess is because their surnames make them shelf-friends in my lovely library, leading to a little confusion that Speak Easy's existence only exacerbates. I won't hold that against it, though. Roll on Speak Easy's publication in the States this August!